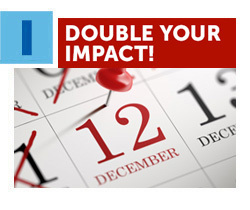 Double your impact of your contribution to the Annual Greater Miami Jewish Federation/UJA Campaign by donating on Monday, December 12! As 2016 comes to an end, Federation is counting on your contributions to support Jewish needs in Miami, in Israel and around the world. This Monday is the perfect time to make your tax-deductible contribution as a generous donor has pledged to match all new and increased donations made on this day! Plus, you’ll also enjoy the benefits of year-end giving. Click here to make your donation now. 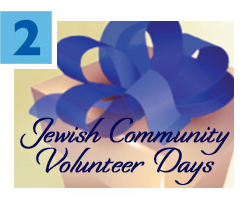 Give the gift of meaning this holiday season and brighten someone’s day by participating in Federation's Jewish Volunteer Center's Eighth Annual Community Volunteer Days. On Friday, December 23 and Sunday, December 25, volunteers of all ages will participate in family-friendly activities that include preparing and serving meals, distributing toys, visiting the sick and elderly and more at several local social-service agencies and health facilities. To learn more about these opportunities and to register, click here. Mark your calendar to join Women’s Philanthropy April 24 - 26 for a Social Action & Civil Rights Journey Through a Jewish Lens. 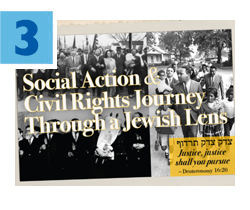 Tour important historic sites in Montgomery, Selma and Birmingham, Alabama while learning about Jewish involvement in the Civil Rights movement of the 1960s and the present-day implications. The mission includes visits to the Southern Poverty Law Center, the Rosa Parks Museum, the Edmund Pettus Bridge and the Civil Rights Institute, as well as lunch with Women’s Philanthropy leaders from the Jewish Federation of Greater Atlanta. For more information and to register, click here. Three Miami Beach brothers — Jared, Koby and Evan Resnick — recently raised $14,300 for the Holocaust Memorial Miami Beach. 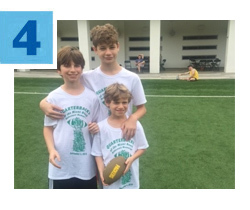 Conceived by 14-year-old Jared as a Bar Mitzvah project for his brother Koby, the Quarterbacks for the Holocaust Memorial Miami Beach event enlisted 50 young athletes and local event sponsors for a flag football tournament on December 4 at the Galbut Family Miami Beach Jewish Community Center. Even youngest brother Evan participated. All proceeds were donated to the Zachor Society, which recognizes donors with an annual gift of $5,000 or more to help preserve the structure and mission of the Memorial. The Holocaust Memorial Miami Beach is a Committee of the Greater Miami Jewish Federation. Read more. According to Federation's overseas partner, The Jewish Agency for Israel, the number of Brazilian immigrants to Israel has broken a 45-year record due mostly to the country's current economic crisis. Approximately 650 Brazilians have immigrated since the beginning of 2016, with the total expected to reach 700 by year’s end. This marks a significant increase compared to the 496 Brazilians who made aliyah last year and the 280 in 2014. The Jewish community of Brazil is the second largest in Latin America after Argentina. 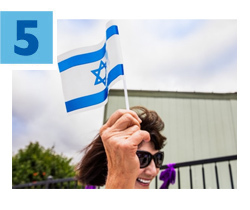 Through The Jewish Agency, Federation is helping new olim (immigrants) connect to Israel via young leadership programs, Jewish youth movements, Israel experience programs and more.